Now you can get better cut protection without sacrificing comfort. While safety and protection should be a top priority, having chainsaw works boot that you can wear comfortably day in and day out should hold just as much importance. Because discomfort can lead to distraction, and you can’t afford distraction in your line of work. The Protector Ultra Signal Red offers all of the above and more. 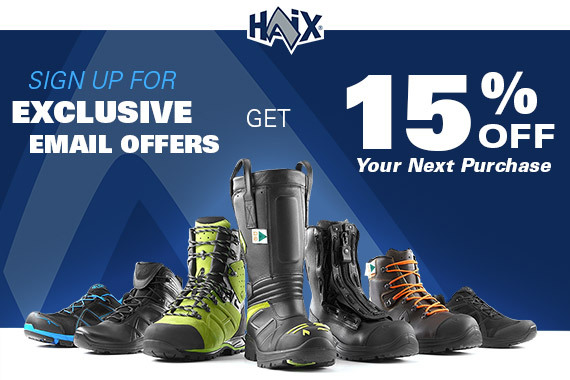 Just like its sister boot, the HAIX Protector Ultra Lime Green, the Protector Ultra Signal Red offers the higher level protection of European Class 2; meaning the boots are tested to a chainsaw speed of 24 m/second. These chainsaw work boots offer exceptional stability on any kind of uneven terrain while feeling surprisingly lightweight. The steel toe also provides the highest level of ASTM toe protection. The brightly colored signal red suede upper works in conjunction with the reflective material at the heel and ankle for increased visibility near the chainsaw both day and night. With an eye toward comfort and safety with an attention to detail, the Protector Ultra Signal Red features a soft close fitting sleeve at the top of the boot that prevents flying wood chips and debris from getting inside and causing irritation to you and to your feet. No cleaning out wood slivers from your chainsaw work boots at the end of a long day.